How would you like to start each and every game of 8-ball you play with a “certain knowledge” that you have every single advantage possible over your opponent? And what if you knew about all the little subtleties that drastically affect everyone’s game that you could use to almost instantly become a dominating pool player in your area? Would you use this newfound knowledge in good competitive fun…or for making money hand over fist? If you’re a good player now…even a mediocre one…you can quickly become virtually unbeatable using an easy to follow system that’s proven to take all levels of 8-ball players to brand new heights. And it won’t take months or even years to get to the point where you’re a feared competitor...in fact, with an open mind and a little bit of practice, you can dominate the game of 8-ball in just a few short weeks. 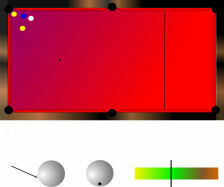 You see, nearly 99% of pool players lack a complete understanding of the game. They play the same no matter what table they’re on, no matter who they’re playing, or what strategy their opponent is using counting only on luck and not on strategy and knowledge. They lack an understanding of how the balls move and how playing conditions (things as minor as table nap, chalk, and cue tip shape) can negatively affect their ability to win consistently. Hence, they’re never able to move from mediocre or good play up to the level we like to call, mastered. But the fact is, there isn’t any magic to gaining such an advantage…or a complete edge…over your opponent. We’re all physically equipped with what we need to become virtually unbeatable players…but so many of us fail to ever “unlock” our hidden potential for various reasons. And more likely than not, you’re probably not even aware of what’s keeping you from becoming great! Along with a simple, easy to learn system for bringing it all together. And once you combine your “new” foundation with and easy to follow system and a few proven secrets on how to resolve the problems in your game you have now, you’ll have a recipe for quickly becoming a consistent contender while you master the game of 8-ball and transform yourself into a virtually unbeatable player. And as incredible as this all sounds, you’ll be amazed at the system’s simplicity and all the “I never knew that” information that the system is built around. Before I share the details of this system, you’re probably wondering who I am and why you should be listening to me in the first place. My name is Ben Kowalski and I’ve been an avid pool player for over 25 years. You’ve probably never heard of me as I haven’t ventured out of my hometown of Long Beach for purposes of playing pool. But I’ve developed a reputation for myself here in town as a feared competitor that always seems to find a way to win. Of course, this wasn’t always the case. Believe me, I paid my dues. Like most people, I thought that improving my game was just a matter of practicing as much as I could. But year after year…playing and practicing…my game never seemed to get all that much better. After reading about every book there was on playing pool and watching every video I could get my hands on…even taking lessons from a certain “pro,” I finally began to catch on. You see, what I found out is that I didn’t understand the game on every level. And I now know for certain that this is exactly why most people can get to good…but never to the level of great. Over time, I learned about everything a person could learn about playing pool. 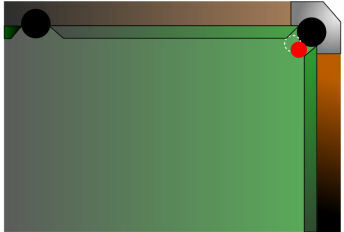 I learned how to read tables, read opponents, and I built a brand new foundation of playing pool. What I thought I knew…all had to be relearned…all the bad habits I picked up…all the misinformation I received…was all replaced with a truly solid foundation that dramatically improved my game from day 1. And from there, I’ve become a veritable force in the game of 8-ball. And everything I’ve learned over the years…the rock-solid foundation, the tips, tricks, techniques…and the secrets of professional pool players have all been compiled into a comprehensive pool playing system that guarantees to turn any level of 8-ball player into unbeatable players. And although it took me years to master the art of pool, it’ll take you only weeks, because everything you’ll ever need to know is jammed into a single, easy to follow guide. Instead of buying 10-20 guides on pool, you can get everything you need to know, right here in just one…Think of it as a shortcut to becoming a master of your art…from finger-painter to icasso in just a few short weeks! When compiling information for 8-Ball Secrets, I wanted to leave no stone unturned. I know first hand that most books on the game of pool today seem to leave off…only to pick up in another book by the same author. And also, most books leave out crucial information that drastically affect the game. nd I can’t understand if it’s because these authors don’t know these secrets or if they’re keeping certain things “under their hats” for fear of their own competition getting a hold of them. And that’s where 8-Ball Secrets is dramatically different. I leave nothing out. If there’s something you need to know to simply improve you game or dramatically take it to an all-new level, you’ll find it in this guide. And before you think this is another book on trick or low percentage shots—think again! 8-Ball Secrets is completely devoid of fluff and filler. Instead, it’s nearly 100 pages of completely practical and usable information.And everything is covered…the basics, shots, position, strategy, banks, cue ball control, practice drills, and mental aspects along with countless tips, tricks, techniques, and secrets known only to professional pool players. Really, all you need to become a consistent contender in 8-ball is this book and a little practice. To improve you have to put in the 8ball practice and work at your game, otherwise you will remain an average player. If you want it to be easy, go and play bingo instead. And 8-Ball Secrets is written in way that you can make a few small changes right away and see immediate improvement! "totaly loved reading all the new things in version 2 of the ebook. Free updates are a great idea!" So What Exactly is 8-Ball Secrets? 8-Ball Secrets is a comprehensive, instantly downloadable, “living” guide that 100% guarantees to dramatically improve your game. It’s jam-packed with nothing but practical, usable advice and countless tips, tricks, techniques, and secrets that will make you virtually unbeatable in the game of 8-ball. Simply put, 8-Ball Secrets is an incredible resource that’s been proven to unlock your hidden potential and turn good…even mediocre players…into virtually unbeatable ones. You will have to train and work hard, there are no shortcuts to get quick results with no training. Discover the foundation you should have learned when you first started—the eye-opening information found in the first chapter sets the tone for the book and instantly gets you excited about learning all those things you missed. Learn how to tell what strategy your opponent is using against you—once you know what the opposition is thinking (and why), you gain an immediate, decisive, and unbeatable edge over them. Learn how to make those “tough” shots you used to never even consider. Discover simple things you can do that encourage…even forces your opponent to make BIG mistakes. Even a few little mistakes you cause for your opponent means great things for your game. Start putting these to work and you’ll become a feared player by all. Learn the closely guarded secrets of positional play. Never let anyone run the table on you again. You’ll learn how to predict ball behavior so that you’ll ALWAYS be the one running the table on your opponent. Master your shots—we’re all physically equipped to make any shot we see. The secret, however, is a little bit of physics knowledge. You’ll get a crash course on physics through beautifully illustrated diagrams that’ll turn those once “tough” shots into child’s play. Discover the deeper secrets of 8-ball and how to control your opponent. This material is some of the reader’s favorites. Watch how a few “innocent” moves by you will make your opponent’s knees tremble and then watch as their game take a turn for the worst…all using a few “mind” tricks. Learn what’s holding you back. I guarantee that with a quick, thorough read of 8-ball secrets, you’ll learn EXACTLY what’s keeping you from rising above your current level…and once you discover what’s holding you back now, you’ll get the tips, tricks, and techniques to turning things around so you can start dominating the game. Practice drills—you’ll get an array of practice shots to work on. Master these and your game will follow, making you a feared competitor who consistently beats their opponents. Learn the secrets of the cue tip and chalk—most players don’t even bother with this information, but you’ll learn all there is to know about the very important relationships and how each could be negatively affecting your game! Find out how different table surfaces (cloth and nap) affect every shot you make. Once you know how to read the table surface, you’ll be able to adjust your play accordingly and you’ll gain an incredible edge over your opponent. Get some great tips on how to gauge surface to determine what you’re dealing with. If you’re the only one to notice a certain roll, you become unbeatable! Discover the secrets of table speed. Every table reacts to speed differently. If you’re using the same speed on different tables, your game is being affected. You’ll learn how to gauge table speed and instantly gain an ENORMOUS advantage in competitive play. Learn how to determine what type of player you’re up against and how to use their weaknesses against them. When you can force your opponent to take only the shots you want them to take, you become feared by all! Become an expert on body language. Learn how to listen what your opponent’s body language is telling you and use it to your advantage. It’s like crawling into their head and knowing exactly what’s going on inside. Learn all there is to know about the break—you’ll instantly see a 100% improvement on your break once you finish this comprehensive chapter. There is simply no more comprehensive or more detailed information on the break then you’ll find in this guide (aiming, rack, ball polish, body movement, timing, cue weight, breathing, rhythm, and more!). Using logic, concentration, discipline, and mind-control to leave you opponents in the dust. Learn how to maximize your positional skills and master your art! Discover my closely guarded secret of “memory position method.” This is “hands-down” the fastest way to learn positional skills and a huge advantage over your opponents. Get tons of “insider” tips, tricks, secrets and strategies that virtually guarantee a winning game. Included is a complete glossary of pool related terms and definitions. Learn how to use this guide for maximum effectiveness—become an unbeatable player through goal setting and progress building, following the easy to use system and checklist that guarantees to bring you from good to great…all in record time! And, you’ll get great game-winning strategies for each! And, because 8-Ball Secret is a “living” guide, if there’s something that’s not covered…or even something that you need more clarification on…all you need to do is contact our friendly and knowledable pool playing panel, and we’ll quickly answer any question you have by email. 8-Ball Secrets is the only “live” book of its kind…meaning it’s constantly being reviewed and updated based on your questions, comments, and concerns in my effort to make this the only book (or video, personal instruction, etc) that you’ll ever need on the game of pool! And remember, this book is written by an avid player with a love for the sport…not by a researcher or book writer that has lost their passion. 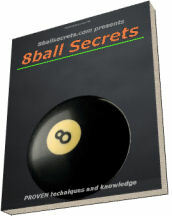 8-Ball Secrets is a guide for pool players by pool players! Tips placed througout the ebook for all levels of player, beginners to advanced. Because of the comprehensive and ever-growing information of this “live” book, I thought first to price it at $49 because of the tremendous amount of work involved…keeping the site up, moderating the forums, answering questions, replying to emails, and constantly keeping you updated with new editions of the guide. But because I don’t want price to stand in your way of becoming a dominating, unbeatable pool player, I cut your investment into the only resource on pool you’ll ever need, down to just $19.97. The 8-Ball Secrets Guide—a comprehensive guide to 8-ball that’s completely overflowing with all the best tips, tricks, tools, and secrets you could ever get in a single place on the sport of pool. Lifetime Updates—when’s the last time a bookstore gave you a free copy of an updated edition of a book you already purchased? Or when has a college given you life-long continuing education for free? What makes 8-Ball Secrets such an incredible investment is the fact that you get free updates for life! Every time a change is made…even if it’s just a word or two, you’ll be the first to know about it. Personal Support—for one full year, you’ll get exclusive, unlimited access to me and my panel of pool players to address any questions or concerns you ever have about your game. This is an incredible resource that I strongly encourage you to use because it guarantees you’ll never have a problem that stands in your way! That’s right! I want you to consider your investment in becoming an unbeatable pool player as a “test-drive” only…being completely at my risk—not yours. So go ahead and order 8-Ball Secrets right now. It’s available by instant download, so you can have it your hands in less than 2 minutes. That means your game can be dramatically improved by tomorrow! 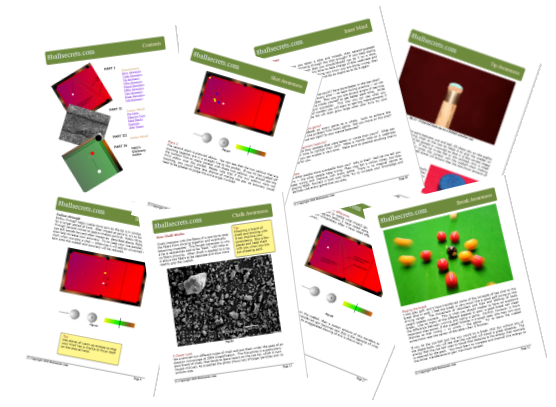 And, if at any time in the next two full months, you can’t honestly say that you’re a waaay better pool player because of the incredible information found in this guide, then I absolutely don’t deserve your money…and frankly, I’d be embarrassed to keep it.…just let me know and I’ll issue a prompt, courteous, and lightning-fast refund of every single penny of your investment—no questions asked! That’s how insanely confident I am that 8-Ball Secrets is not only going to change the way you shoot pool, but it’s going to change the way you think and feel about the game in general. But don’t let the small investment into this guide fool you…by producing it in digital form, I save thousands on the cost of production, binding, and distribution…so what could easily run $49 or more in the stores will cost you less than a night out. Think about it…you probably spent far more than $20 that last time you went out for the evening…dinner, drinks, maybe a movie? One person can’t get all that for $20. And when the night is over, you’ve got nothing left to show for it, right? But, for less than $20 and a couple weeks of practice, you can become a significantly better pool player…running tables…humiliating opponents…impressing your friends…controlling minds…even making a few bucks with your one-time investment of $19.97 in the 8-Ball Secrets guide. Wishing you great 8-ball success! P.S. Remember, I’m taking all the risk with your investment today. If you’re not completely thrilled with 8-Ball Secrets, just let me know and you’ll get a lightning-fast refund of your investment…every single penny…no questions asked! P.P.S. If you’ve ever dreamed you could possess the skills, techniques, and secrets of the pros…to be able to control the game…to be able to “unlock” your hidden potential and take your game to an all new level, you simply won’t want to be without 8-Ball Secrets!